New PyLoN-IR, Controllerless, Liquid Nitrogen Cooled Spectroscopy Camera Has Fastest Spectral Rate and Reduced Dark Current. 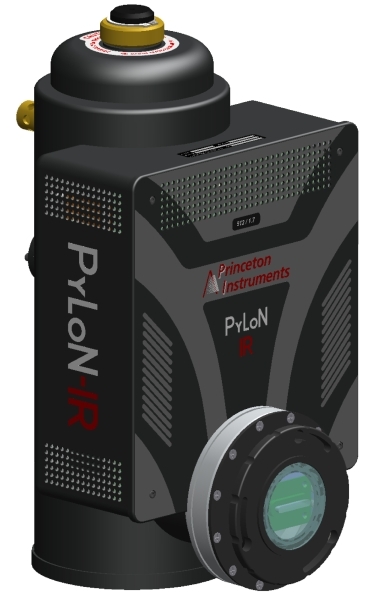 November 13, 2012 - Trenton, NJ — Princeton Instruments is pleased to introduce the PyLoN®-IR, controllerless, cryogenically-cooled CCD camera for spectroscopy. The PyLoN-IR is linear InGaAs photodiode array camera and is designed for quantitative near-infrared and short-wavelength infrared applications that demand the highest possible sensitivity, including photoluminescence and Raman spectroscopy. PyLoN-IR replaces PI’s OMA V InGaAs detector linear photodiode array camera. PyLoN-IR’s liquid nitrogen cooling greatly reduces dark current that occurs from thermal energy within the CCD and its indium metal seals enhance vacuum longevity. Ed Gooding, PI’s Spectroscopy Product Manger shares that “this InGaAs detector offers 16-bit digitization and leads the industry with the fastest spectral rate of up to 6600 spectra/sec, and lowest system read noise.” Additionally, by removing the external controller, PyLoN-IR has increased experimental flexibility with its improved ultra-low-noise electronics. Two PyLoN-IR models are available with wide spectral coverage. Model 1024-1.7 is responsive in UV and visible with high sensitivity from 800 nm to 1.7 μm, with the 1024-2.2 version’s spectral range from 1.0 to 2.2 μm. PyLoN cameras operate on 32-bit and 64-bit Microsoft® Windows® operating systems and are fully supported by LightField®, Princeton Instruments’ advanced, 64-bit data acquisition software featuring the patented IntelliCal® spectrograph calibration system. The latest Gigabit Ethernet (GigE) interface allows remote camera operation via a single cable without the need for custom frame grabbers. PyLoN cameras are available with or without a 40 mm shutter. Princeton Instruments designs and manufactures high-performance CCD, ICCD, and EMCCD cameras; spectrographs; and optics-based solutions for the scientific research, industrial imaging, and OEM communities. We take pride in partnering with our customers to solve their most challenging problems in unique, innovative ways. Princeton Instruments is a registered ISO 9001: 2008 company. For more information on Princeton Instruments products, please visit www.princetoninstruments.com.